The ecommerce holiday shopping season is almost upon is and it’s important that you’re prepared for your biggest sales of the year. If you don’t know what that means, the ecommerce holiday shopping season is the biggest shopping season of the year. To get the most out of it, you’ll need a good plan for great sales. The ecommerce holiday shopping season starts at the beginning of the November for most retailers, although some stores start their shopping season at the end of October in preparation for Halloween. Last year, sales from the holiday shopping season totaled $91.7 billion dollars, an 11% increase over the last year. Of that shopping period, a full 57 days reached daily sales topping $1 billion. In order to get your piece of the ecommerce holiday shopping season, you need to be prepared. You should be planning your sales and promotions strategy and have it ready to be implemented by November. 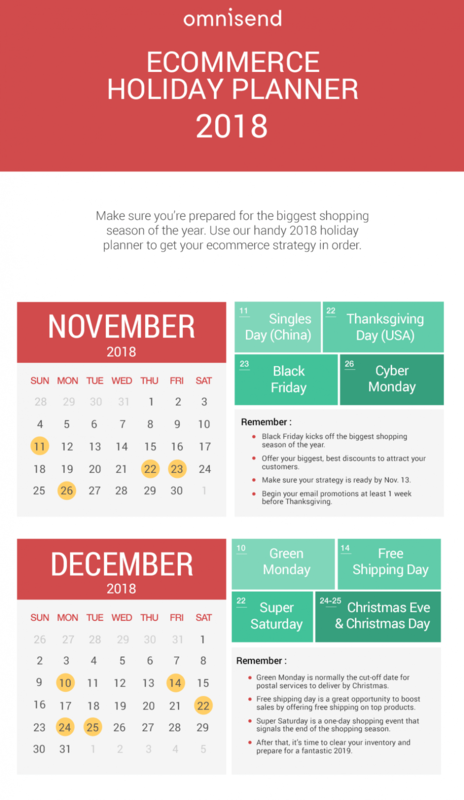 Below is a handy infogrpahic that shows you the most important sales days of the 2018 ecommerce holiday shopping season. Let’s go through these dates in detail. 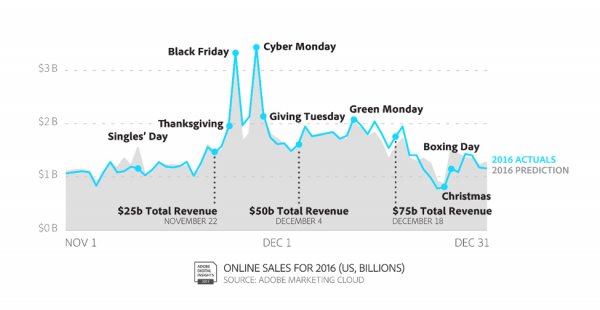 November is the official kick-off month for ecommerce holiday sales. But, as I said before, many stores can begin to see their sales spike with the Halloween holiday. This is normally for party- or costume-related stores. For general stores, sales begin to lift in the beginning of November. For many, sales don’t really begin until Thanksgiving week. 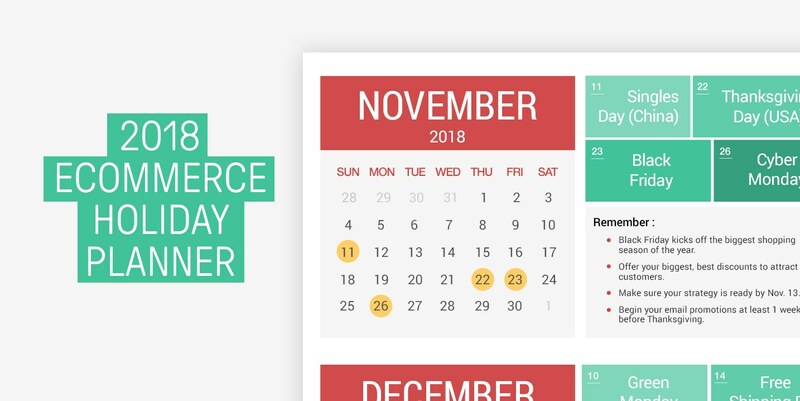 For our purposes, therefore, there are four important sales dates in November that we should be watching for the ecommerce holiday shopping season. Singles Day is named so because it’s on the 11th of November, which is also written as 11/11. Although it’s a major shopping day, it’s not connected to the US at all. Instead, it’s a day promoted by Alibaba in China and, based on last year’s numbers, the biggest shopping day in the world. In 2015, sales reached $14.3 billion, while last year it went up to $17.8 billion. While a huge chunk of that went to Alibaba, a significant portion went to other retailers as well. In fact, in 2016, 27% of purchases made went towards international brands or merchants. It’s also important to remember that 87% of all sales were made on mobile. If you want to grab a piece of that big pie, you should start thinking about your own Singles Day sales. Of course, Facebook Ads won’t work (since the social media platform is banned in China), but you can use Google Adwords or other platforms to get the word out. While Thanksgiving is largely an American holiday on the 4th Thursday of November, many retailers have begun opening their doors (physically) on Thanksgiving night to begin the Christmas shopping season. Over time, that has moved to the online world as well, making it the official beginning of the ecommerce holiday season in the US and around the world. 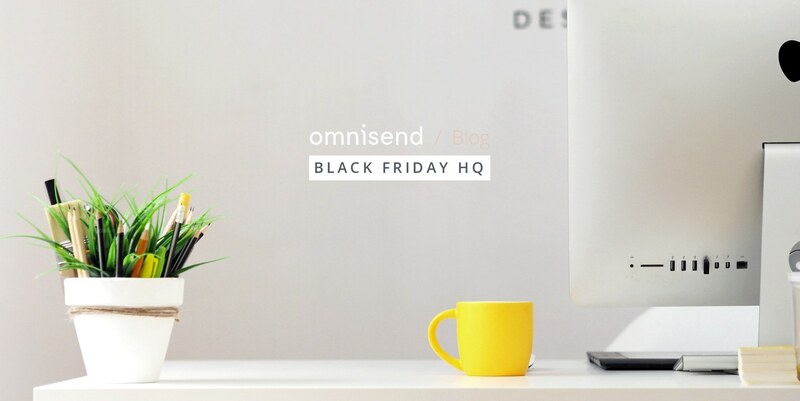 While Black Friday signifies the actual start of the ecommerce holiday shopping season, promotions generally begin in the week of Thanksgiving. If you want to take advantage of the best opportunity for major sales, you should start your campaigns on the Monday before Thanksgiving and can even consider having the biggest discounts on the night of Thanksgiving for American audiences. International audiences aren’t that concerned with Thanksgiving, therefore you can start your promotions for them in the middle of the week. No matter what promotions the big retailers are running, and what you may try, the big ecommerce holiday sales don’t begin until Black Friday. This shopping holiday started in the US as most companies gave their employees Friday off after Thanksgiving, making it a 4-day weekend. As most people plan their Christmas shopping around this time, it quickly became the major shopping day. Black Friday now is still the same and continuing to expand. It is the time for you to give your absolute best discounts. Prepare for major sales and major visits, as people are buying many big-ticket items for their loved ones. Conversion rates are highest at this time, whereas before Black Friday people are simply browsing and waiting for the mega sales to begin. The average order value (AOV) naturally goes down during this period as the big discounts start to kick in. So while 1 item may net, for example, $50 before Thanksgiving, for the Black Friday Cyber Monday (BFCM) weekend, it’ll go for only $25. Cyber Monday was meant to be the ecommerce version of Black Friday, which was normally focused on brick and mortar shops. However, that seems to have blended to the point where the entire BFCM weekend is a mix-bag of brick and mortar and ecommerce holiday sales. Smartphone purchases for 2016 was at 42% throughout. However, although conversions from smartphones peaked on Cyber Monday at 2.8%, it was not as great as desktop conversions, which came in at 3.6%. 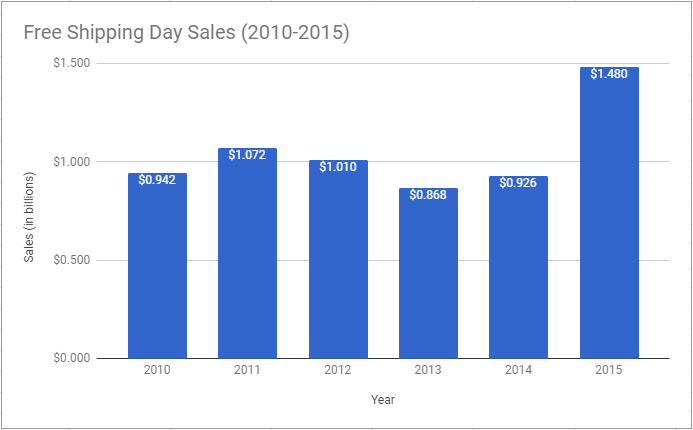 Sales continue to extend to the Tuesday after Cyber Monday, known as Giving Tuesday, which emphasizes giving to charity after the BFCM sales rush. 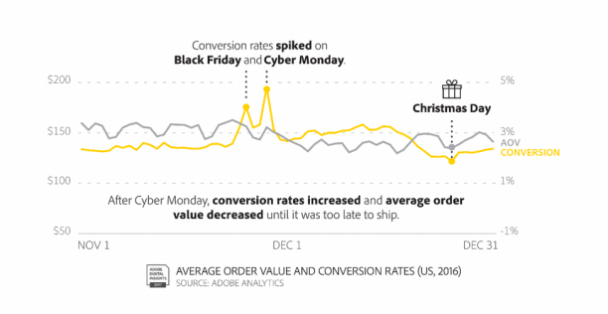 December is a great month for ecommerce sales. You can pretty much get the bulk of the entire ecommerce holiday shopping in the period from Black Friday through roughly one week before Christmas. However, there are 3 major ecommerce holiday shopping dates to remember before Christmas. Green Monday is a term coined by eBay to describe its best sales day of the year. It is normally determined as the second Monday of December, and coincides with the cut-off date for when most postal services can deliver packages to customers before Christmas. Because of this, people are doing their best to finish up their Christmas shopping on this day. You should reserve your great discounts for Green Monday as well. Continue your retargeting campaigns to reach those visitors who came to your store but haven’t bought anything yet. In order to extend the shopping season, retailers are increasingly promoting the Free Shipping Day, this year coming on the 14th of December. The event was created when retailers noticed that sales after Cyber Monday fell dramatically. While Green Monday gave a good boost to sales, they realized that most people were scared that anything after then would not be delivered in time for Christmas Eve. For that reason, they’re promoting Free Shipping Day, which has seen tremendous growth over the year. Officially, as of 2013, it is only for merchants that give absolutely free shipping on that day (no minimum order requirements, for example) and can guarantee delivery by Christmas Eve. If you have a dropshipping business, this may not be a day for you to participate in, as shipping times are usually slower during December. However, if you have good shipping times, you should participate in this to extend your ecommerce holiday shopping season. It’s important to remember that most big-ticket items are bought during the BFCM weekend. After that, people buy smaller items. This is especially true for Super Saturday, which is a one-day event for last-minute, less significant items. This day is also known as Panic Saturday, as it is aimed at people who still haven’t purchased their Christmas gifts. In that sense, it is more applicable for brick and mortar retailers, rather than ecommerce shops. However, you should focus instead on it being the last day of the year to get the best discounts. These are for items that will probably only arrive to the customers in January, and you should communicate that to the customers. Think of this as a golden opportunity to clear out your inventory. It is the last big day of the ecommerce holiday shopping season. These days are, obviously, low shopping days. That’s because most people in Western countries are not online or in shops, but instead spending time with their family and friends. However, when it comes to ecommerce, the whole world is your market. In many countries, December is no more significant than November. In many Western countries, there’s also Boxing Day (the 26th) which is an opportunity to buy end-of-season items. 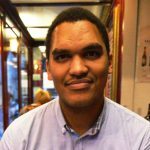 It is a good opportunity to change up your audience and focus on non-western countries. There, you can extend the ecommerce holiday shopping season. You should focus on clearing out more of your inventory, as savvy shoppers are looking for close-out, end-of-season or after-season sales. No matter what days you choose to focus on in your ecommerce holiday plan for great sales in 2018, you should have a plan in place. By November, that plan should already have most of its parts in place and you should be focusing on how to implement it. how low can you go (what are the best deals you can offer)? how long can you offer those deals? which specific audience are you targeting? how much can you afford to spend on ads? how can you re-engage or interest previous customers? That last question is important to consider. After all, the 2018 ecommerce holiday shopping season isn’t just for new customers. In fact, you can get a huge chunk of your sales from current customers. That coincides with the difficult fact that your advertising costs are going to increase dramatically as you’ll be competing against the big retailers with mega ad budgets. If you have your email subscriber list, however, then you have a direct channel to communicate with a targeted audience—the people who’ve already bought from you. Use it wisely. No matter what days or channels you choose, you should work your hardest in the upcoming weeks and months to get your biggest sales of the year. Holiday planning is all about messaging and timing. My two cents is, plug your brand into a remarketing framework. It’s critical to help you build retention early so you can cash in later. We highly recommend remarketing, so you can reactivate past customers or people who have been exposed to your brand previously. Retailers will have great success if they layer remarketing audiences on all campaigns, not just display. Hope that helps the cause!